I’ve been using this great command for a long time. Lately, it started giving me trouble. the print command that follows the pdfsetup generates a hardcopy - i.e. the print “” goes to the actual default printer. In some cases: it works perfectly - the pdf is produced and saved to the proper folder. In some cases: there is no hardcopy printed, there is no PDF in the proper folder and I can’t find any pdf file that was produced. If I remember correctly, that statement has been replaced quite a long time ago. In fact, I cannot find it in the Pan 6 documentation any more. Have a look in the Programming Reference for the printpdf statement. The printpdf statement hasn’t worked for quite some time. 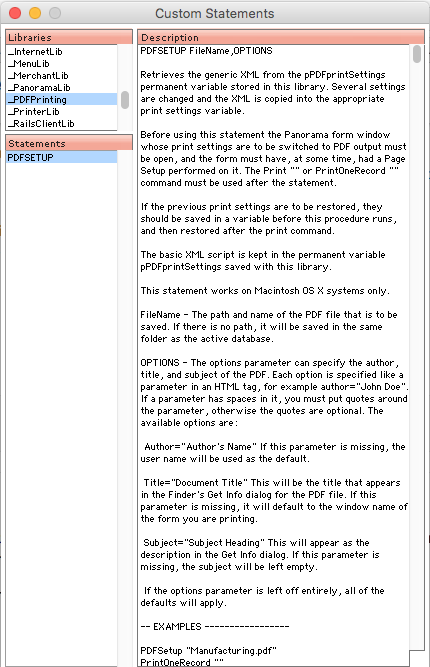 The pdfsetup statement is one I wrote, based on code provided by David Duncan, as a way of dealing with that. The last few releases of Panorama 6 included the library that contained it, but Provue never included it in the documentation. To see its documentation, you need to look in the Custom Statements wizard. This is little more than a guess, but I would expect a long folder name in the specified folder, or any folder in its path, to create a problem. A long name for the file should not be a problem. A long name would be anything longer than 31 characters. yes, i have it - I’ve been using it for a long time and love it and thank you Dave & david for it. it is very strange that it is suddenly giving my trouble now. can a file get corrupted somehow that would cause this ? i made sure all the forms i’m using have gone thru “page setup” before using the pdfsetup command. Dave is correct. I looked into the code of some of my databases, and pdfsetup is still working perfectly here. I use it routinely and wrote it into two procedures in the past week. Possibly sharing your procedure, especially the path might be helpful.